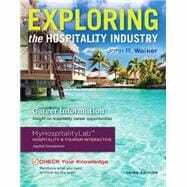 by Walker, John R.; Walker, Josielyn T.
Exploring the Hospitality Industry helps readers advance in their careers by giving them a broad foundation of hospitality industry knowledge presented in a lively, visually appealing, engaging manner. The emphasis is on the people, companies, and positions that make up the hospitality industry today, and the focus on sustainability includes case studies on practitioners and corporations that engage and involve readers as they explore the trends in this ever-growing field. The book moves beyond just restaurants and hotels to cover all facets and segments of the industry, including new growth areas such as event management, meeting planning, cruising, theme parks, and gaming entertainment. This title is also available with MyHospitalityLab–an online homework, tutorial, and assessment program designed to work with this text to engage students and improve results. Within its structured environment, students practice what they learn, test their understanding, and pursue a personalized study plan that helps them better absorb course material and understand difficult concepts. To help students explore the hospitality industry, MyHospitalityLab includes industry-specific simulations from Hospitality & Tourism Interactive (HTi), and real case studies written by industry leaders. MyHospitalityLab should only be purchased when required by an instructor. John R. Walker, D.B.A., FMP, CHA, is a Fulbright Senior Specialist and the McKibbon Professor Emeritus of Hotel and Restaurant Management at the University of South Florida, Sarasota–Manatee. John’s years of industry experience include management training at the Savoy Hotel London, followed by stints as assistant food and beverage manager, assistant rooms division manager, catering manager, food and beverage manager, resident manager, and general manager with Grand Metropolitan Hotels, Selsdon Park Hotel, Rank Hotels, Inter-Continental Hotels, and the Coral Reef Resort, Barbados, West Indies. He has taught at two- and four-year schools in Canada and the United(States. In addition to being a hospitality management consultant and author, he(has been published in the Cornell Hotel Restaurant Administration Quarterly, the(Hospitality Educators Journal and the New York Times. He is a 10-time recipient of the President’s Award for teaching, scholarship, and service; and he has received the Patnubay Award for exemplary professional performance through teaching and authorship of tourism and hospitality publications. John is an editorial advisory board member for Progress in Tourism and Hospitality Research. He is a past president of the Pacific Chapter of the Council on Hotel, Restaurant, and Institutional Education (CHRIE). He is a certified hotel administrator (CHA) and a certified Foodservice Management Professional (FMP). He and his wife Josielyn T. Walker have twins, Christopher and Selina. The Walkers live in Sarasota, Florida.